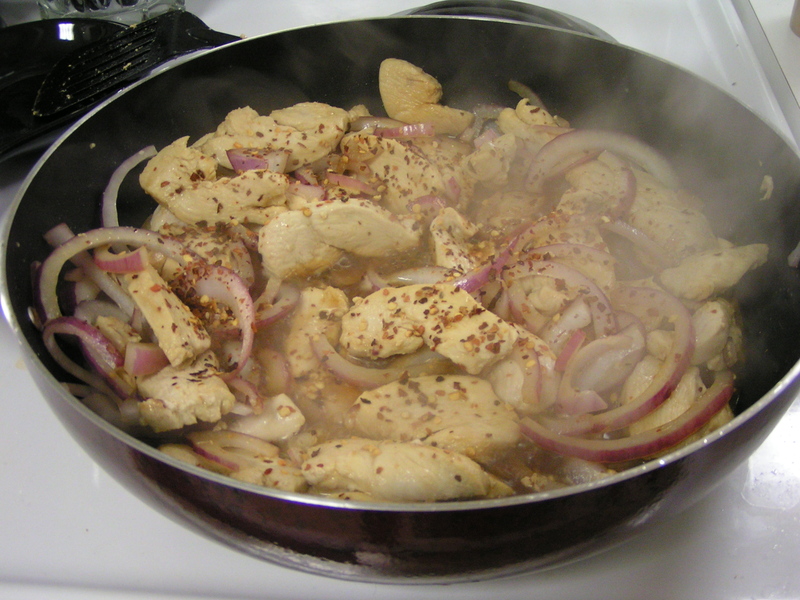 Monday, I had some boneless, skinless chicken breasts hanging out in the fridge. I didn’t really know what I was going to do with them, but they needed to move along. So I threw them in Tupperware with about a cup of orange juice. I figured that would at least give them some flavor, and maybe some juiciness also, and me some time to figure out what the heck to do with them. So last night, after yoga and pilates and mostly conquoring the HUGE basket of laundry that Rat Boy dumped in my laundry room (I really wonder if he had ANY clean clothes left in his room but that is a story for another universe time)…after all that, I realized I hadn’t made dinner. And it was 9 PM!!! Hubby leaves for work about 10-10:15. CRISIS MODE!!! Then, I remembered the chicken and started rummaging to see what else I could find. I had an onion. A red bell pepper was hanging out in the back of the produce drawer. I always have rice and pasta. And I located some broccoli that looked like it was ready to get up and leave the room. On its own. 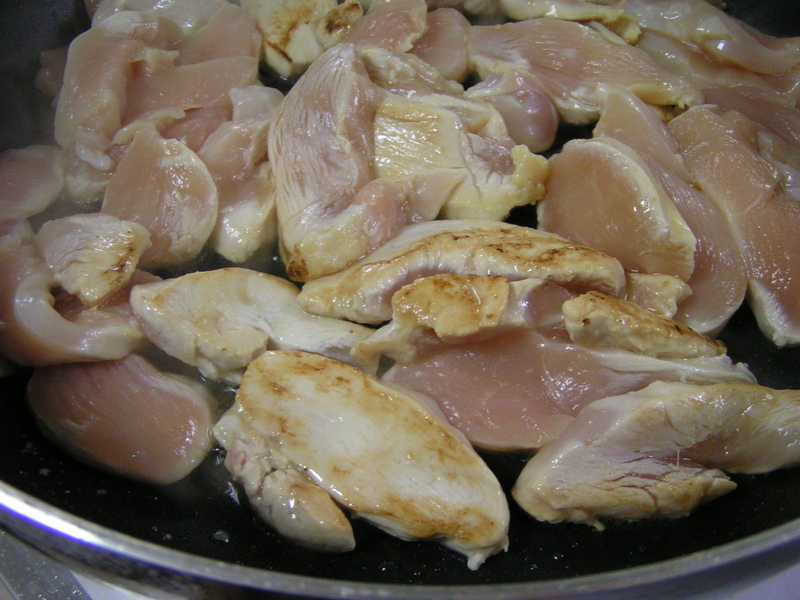 I started by slicing the marinated breasts pretty thinly. 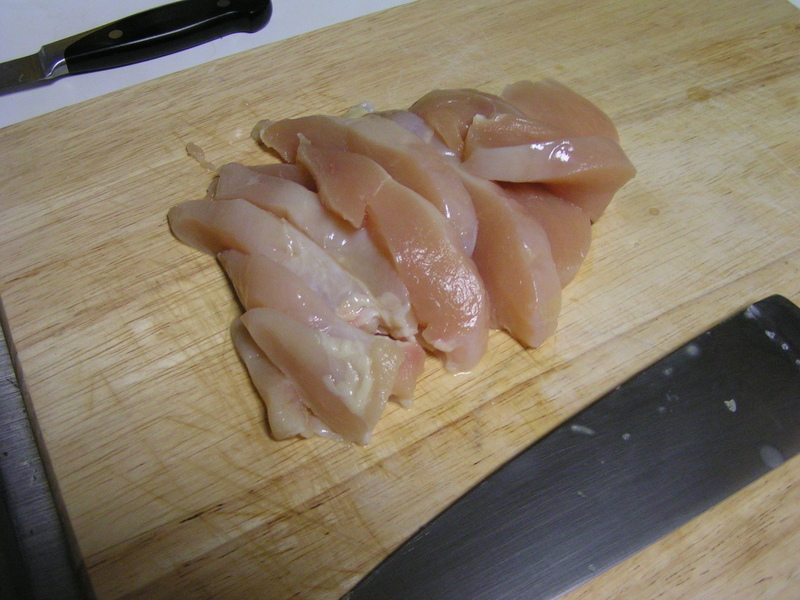 Pretty unimpressive looking raw chicken. I have an electric stove 😦 so I don’t use a wok. Instead I started the large skillet heating, and drizzled some basil infused olive oil into it. When it was hot…REALLY HOT, I tossed in the chicken to brown. Then thinly slice an onion and toss that in also. 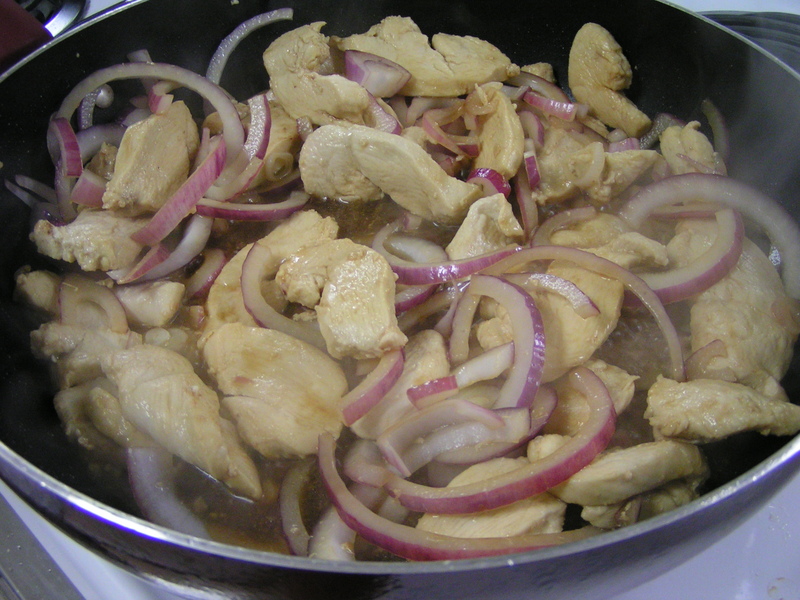 The chicken will juice as it cooks so keep up the heat and the stirring. 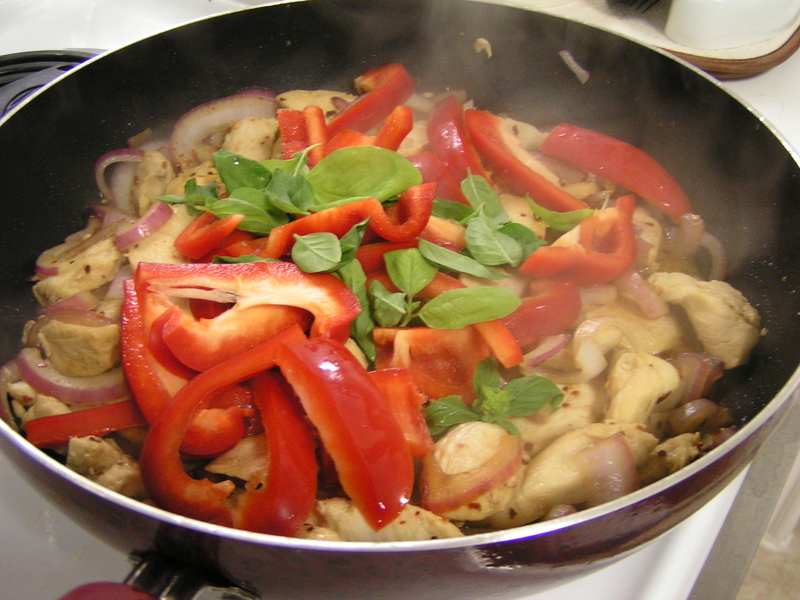 Add red pepper flakes to taste. We like it HOT! Keep stirring! While some of the liquid was steaming off, I started thinking sauce. I just had to use the orange juice, so I whisked that together with about 1/2 cup of light soy sauce, a couple of dashes of rice wine vinegar, and a tbsp of corn starch. 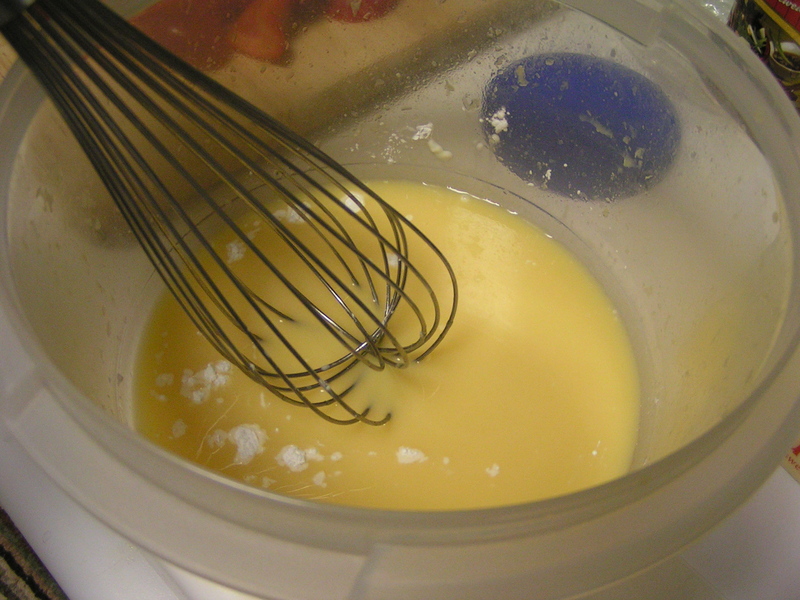 I ❤ corn starch…since I finally moved out of the Dark Ages and started using it! Add all the liquid to the pan and stir, stir, stir! Add the other veggies you want to include. 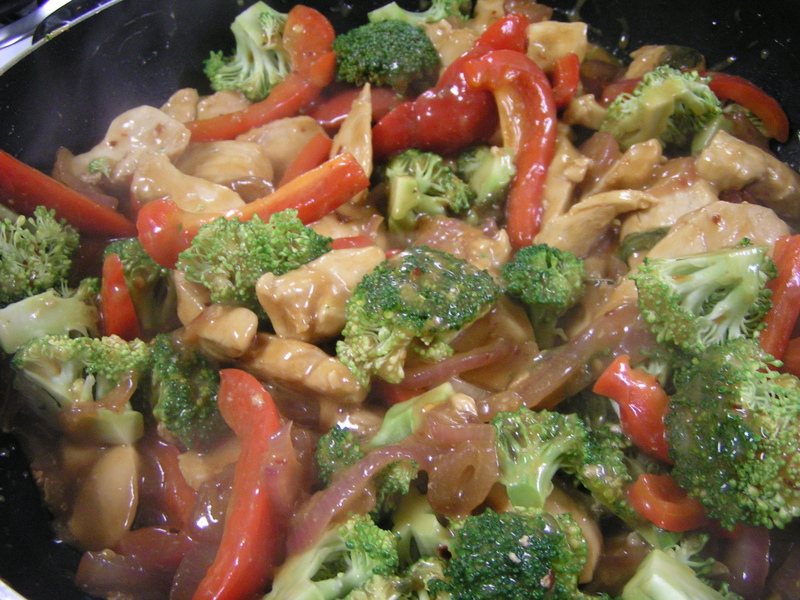 Last night it was red bell pepper and broccoli. Nice red/green combo! And, yes, that’s basil. Don’t tell Hubby. 🙂 Had to trim the plant yesterday…again. You’ll want to turn down the heat and stir until the sauce thickens, then cover the pan, and let the steam work on the last veggies so they aren’t completely lifeless and wilted. I totally hate soggy broccoli! You’ll note everything has a nice glaze to it. That’s the corn starch at work. If you stop stirring too soon, it WILL burn and stick, creating the gooey gelatinous mess from the Black Lagoon, which by the way, IS actually in Texas. East Texas. A whole different world out there. I know. I have relatives. Back to the chicken. 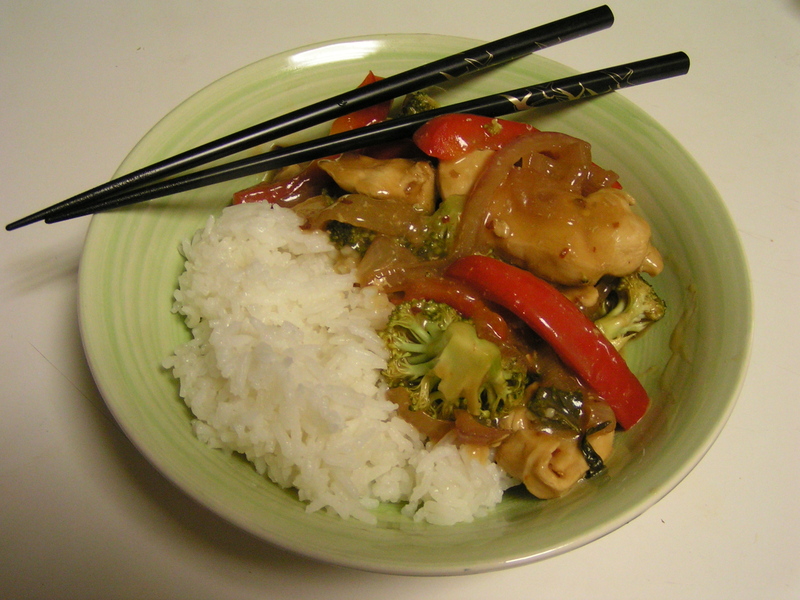 I decided to serve it with rice, as it had taken on a distinctly Oriental flavor in the creative process. The basil was a nice, slightly peppery addition. I didn’t use any garlic, but I’m sure it can do nothing but improve any dish, so I’ll probably add some next time, and maybe some real hot peppers if I have them. This didn’t turn out too spicy, regardless of the quantity of red pepper flakes I used! Oh, totally making Orange Chicken a la Aggie tonight. Son and Eldest love it. I have to say, I will pass on the pepper flakes, though. Everyone that likes spicy can add to it iff’n they want! Now I know what’s for dinner tonight! Thanks- it sounds absolutely wonderful and super easy- perfect for a Saturday night “clean out the produce drawer” meal before tomorrow’s shopping trip!